Pierre Berton, Canada’s most popular historian and a member of the Newsman’s Hall of Fame, was born in the Yukon and educated at UBC. He has received three Governor General’s Awards, two Nellies, two National Newspaper Awards, the Stephen Leacock Medal for Humour, and an award from the National History Society. He holds twelve honorary degrees and is a Companion of the Order of Canada. 1994-04-08. New. Ships with Tracking Number! INTERNATIONAL WORLDWIDE Shipping available. Buy with confidence, excellent customer service! 1998-04-06. New. Ships with Tracking Number! INTERNATIONAL WORLDWIDE Shipping available. Buy with confidence, excellent customer service! 1997-05-06. New. Ships with Tracking Number! INTERNATIONAL WORLDWIDE Shipping available. Buy with confidence, excellent customer service! 2009-07-05. New. Ships with Tracking Number! INTERNATIONAL WORLDWIDE Shipping available. Buy with confidence, excellent customer service! McClelland & Stewart, 1994-07-30. First Paperback Edition. Mass Market Paperback. Used:Good. Excelsior Editions. PAPERBACK. 1438429282 New Condition. . New. Kodansha Amer Inc. Hardcover. 1568361548 New Condition. . New. McClelland & Stewart. MASS MARKET PAPERBACK. 0771012179 New Condition. . New. Penguin Books. PAPERBACK. 0140270167 New Condition. . New. 1997-05-06. Good. Ships with Tracking Number! INTERNATIONAL WORLDWIDE Shipping available. May not contain Access Codes or Supplements. May be ex-library. Shipping & Handling by region. Buy with confidence, excellent customer service! 1998-04-06. Good. Ships with Tracking Number! INTERNATIONAL WORLDWIDE Shipping available. May not contain Access Codes or Supplements. May be ex-library. Shipping & Handling by region. Buy with confidence, excellent customer service! McClelland & Stewart, Inc, 1992-01-01. First Edition. Hardcover. Used:Good. 2009-07-05. Good. Ships with Tracking Number! INTERNATIONAL WORLDWIDE Shipping available. May not contain Access Codes or Supplements. May be ex-library. Shipping & Handling by region. Buy with confidence, excellent customer service! Excelsior Editions/State University of New Yo, 2009-07-01. Paperback. Used:Good. Excelsior Editions. PAPERBACK. 1438429282 Like New Condition. . Fine. Penguin Books. PAPERBACK. 0140270167 Like New Condition. . Fine. McClelland & Stewart. MASS MARKET PAPERBACK. 0771012179 Like New Condition. . Fine. Kodansha Amer Inc. Hardcover. 1568361548 Like New Condition. . Fine. Toronto, Ontario: McClelland & Stewart/Tundra Books, 1992. 480pp. 38 b/w photos, 9 maps by Geoffrey Matthews, illustrated endpapers. A history of Niagara Falls, packed with unlikely characters and larger- than-life personalities who transformed a great natural wonder into a theatrical backdrop.. First Edition. Cloth. Very Good/Very Good. 8vo - over 7¾" - 9¾" tall. Toronto: McClelland & Stewart, 1992. 1992 FIRST EDITION Hardcover book in Dust Jacket. VG book in VG jacket ; Clean and unread, in intact jacket ; with numerous minor flaws that sound worse than they look, ie: faint bit loose, couple of smudges and a small dent on top boards, corner bumps, small faint smudge decorated endpages one spot, not affecting any of the illustrations, tiny corner crease to a few pages bottom inside; jacket has tiny faint bottom crease inside edge, tiny closed nick faint slight bends top spine edge. None of this affects its use or beauty. Unread, in intact jacket. Book size: 6-1/4" wide x 9-3/4" tall x 1-3/4 " thick; 480 pages with index + 2-page map in front, 9 maps altogether + illustrated endpages by Tom McNeely + 24 pages of Glossy black & white historical photographs. Handsome book, red textured boards with Gold gilt title impressed on spine, in matching red & gilt titled glossy color illustrated jacket with painting by Gerald Sevier + small photo by Elsa Franklin of the author with the Falls in the background on the inside back jacket flap. Sweeping history of Niagara Falls ... the 3 century story of how humans transformed a great natural wonder into a theatrical backdrop and created " the genie of electricity " ..... Beautifully illustrated ..... showing the usefulness of the falls to modern electrical plants ... as well as the engineering that went into the platforms and structures that ' tame ' it to some extent for tourists today ... and the political wrangling that has gone on over the years about the ' fate ' and destiny of this great natural wo nder located right on the boundary line of two countries ... This is fascinating for the historian and tourist alike ... The late great Pierre Berton was one of the foremost, and certainly the most beloved, historians in Canada, and studied and wrote about her history for decades. This is one of his finest books, on a wonder of the world that is a treasure for Canadians, Americans, and international tourists alike " Niagra - A History of the Falls " ... by Pierre Berton ... with illustrations by Tom McNeely ... 1992 Hard cover book in DJ First , published by McClelland & Stewart, Toronto, Canada ; in English only *** Secure packing for Safe Shipping since 1965 *** . First Edition. Hard Cover in Dust Jacket. Very Good/Very Good. Illus. by Tom McNeely. 6-1/4 x 9-3/4 x 1-3/4 ". Toronto: McClelland & Stewart, 1992 A near fine Canadian first edition, first printing hardback (previous owner inscription present) - in a near fine dustjacket - All my books are always securely packed with plenty of bubblewrap in professional boxes and promptly dispatched (within 2-3 days) - SIGNED & INSCRIBED BY THE AUTHOR - Pictures available upon request. Excelsior Editions. PAPERBACK. 1438429282 Special order direct from the distributor . New. Excelsior Editions. PAPERBACK. 1438429282 . New. Excelsior Editions. PAPERBACK. 1438429282 Remainder mark . Fine. Toronto: McClelland and Stewart, 1992 Very gently used; little wear. Text is clean. Illustrated. 480 pages. Toronto, Ontario: Toronto, ON: McClelland & Stewart ( M&S ), 1992, 1st Edition, First Printing, 1992. 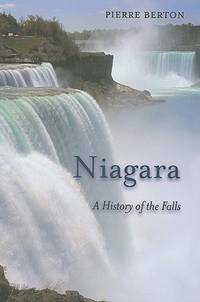 ----------hardcover, a Near Fine copy in a Near Fine dustjacket, signed and dated in the year of publication by Berton, 480 pages, b&w photos, ---"Niagara Falls has always been more than just a natural wonder. The sublime beauty and awesome power of the great cataract have made it a magnet for statesmen and stuntmen, poets and poseurs, ordinary sightseers and exceptional visionaries. This book traces the history of the Falls and those drawn to it: industrialists who come to harness its power, movie stars who come to garner publicity, photographers who come to test new techniques, and honeymooners who come to start new lives. As Pierre Berton shows, the history of the Falls is a chronicle filled with exceptional characters: Charles Blondin, the French daredevil who crossed the Falls on a high wire; John Roebling, the engineer who spanned the Niagara gorge before he built the Brooklyn Bridge; Henry Perky, the inventor of shredded wheat; and Robert Moses, the "Power Broker" himself. " ---, any image directly beside this listing is the actual book and not a generic photo ///SIGNED ---GUARANTEED to be AVAILABLE///. Signed. First Edition. Hard Cover. Near Fine (see description)/Near Fine (see description). Illus. by Gerald Sevier Cover Art. NOT Price Clipped. Excelsior Editions. PAPERBACK. 1438429282 BRAND NEW, GIFT QUALITY! NOT OVERSTOCKS OR MARKED UP REMAINDERS! DIRECT FROM THE PUBLISHER!|1.45 . New. Doubleday of Canada, 2002-01-01. Paperback. Used:Good. NF/VG. Lightly bumped spine e nd s. D J h as l "ight edge wear, light rubbing and light scoring. First Canadian Edition. First Printing. Price-clipped. Large / heavy item may require extra shipping." . Near Fine . Hardcover . 1st Edition . 1992 . McClelland and Stewart, 1992. Hard Cover. Good. New York: Kodansha. Fine copy in fine dust jacket. 1997. 1st. Hardcover. 8vo, 371 pp. .
Toronto: McClelland & Stewart Ltd, 1992. Hardcover. Thick 8vo. Black and white photographic reproductions. Very good+ in very good+ dustjacket. Toronto, Ontario: Toronto, ON: McClelland & Stewart ( M&S ), 1992, 1st Edition, First Printing, 1992. ----------hardcover, a Near Fine copy in a Very Good+ dustjacket, signed and dated in the year of publication by Berton, 480 pages, b&w photos, ---"Niagara Falls has always been more than just a natural wonder. The sublime beauty and awesome power of the great cataract have made it a magnet for statesmen and stuntmen, poets and poseurs, ordinary sightseers and exceptional visionaries. This book traces the history of the Falls and those drawn to it: industrialists who come to harness its power, movie stars who come to garner publicity, photographers who come to test new techniques, and honeymooners who come to start new lives. As Pierre Berton shows, the history of the Falls is a chronicle filled with exceptional characters: Charles Blondin, the French daredevil who crossed the Falls on a high wire; John Roebling, the engineer who spanned the Niagara gorge before he built the Brooklyn Bridge; Henry Perky, the inventor of shredded wheat; and Robert Moses, the "Power Broker" himself. " ---, any image directly beside this listing is the actual book and not a generic photo ///SIGNED ---GUARANTEED to be AVAILABLE///. Signed. First Edition. Hard Cover. Near Fine (see description)/Very Good+ (see description). Illus. by Gerald Sevier Cover Art. NOT Price Clipped. Toronto, Ontario: Toronto, ON: McClelland & Stewart ( M&S ), 1992, 1st Edition, First Printing, 1992. ----------hardcover, a Near Fine copy in a Near Fine dustjacket, signed and dated in the year of publication by Berton "To A____ Pierre Berton Nov '92", , 480 pages, b&w photos, ---"Niagara Falls has always been more than just a natural wonder. The sublime beauty and awesome power of the great cataract have made it a magnet for statesmen and stuntmen, poets and poseurs, ordinary sightseers and exceptional visionaries. This book traces the history of the Falls and those drawn to it: industrialists who come to harness its power, movie stars who come to garner publicity, photographers who come to test new techniques, and honeymooners who come to start new lives. As Pierre Berton shows, the history of the Falls is a chronicle filled with exceptional characters: Charles Blondin, the French daredevil who crossed the Falls on a high wire; John Roebling, the engineer who spanned the Niagara gorge before he built the Brooklyn Bridge; Henry Perky, the inventor of shredded wheat; and Robert Moses, the "Power Broker" himself. " ---, any image directly beside this listing is the actual book and not a generic photo ///SIGNED and INSCRIBED ---GUARANTEED to be AVAILABLE///. Signed. First Edition. Hard Cover. Near Fine (see description)/Near Fine (see description). Illus. by Gerald Sevier Cover Art. NOT Price Clipped. Toronto, Ont: McClelland and Stewart. Very Good with no dust jacket. 1992. Trade Paperback. 0771012217 . Trade Paperback in very good condition. Light scuffing to the covers with spine end and corner bumping. Tightly bound with a bright & clean interior. Maps. ". This book traces the history of the Falls and those drawn to it: industrialists who come to harness its power, movie stars who come to garner publicity, photographers who come to test new techniques, and honeymooners who come to start new lives." ; B&W Photographs; 1.57 x 9.06 x 6.06 Inches; 480 pages . New York: Kodansha, 1997. Hardcover. Near Fine/Near Fine. 8vo - over 7¾ - 9¾" tall. Near Fine/Near Fine condition. CANADA: McClelland & Stewart, 1992. Long Inscription of owner at start of book. Book and dustwrapper/dustjacket are in very good plus condition with very minor signs of wear and/or age. Dustwrapper/dustjacket is price clipped. SPECIAL POSTAGE RATES APPLY Packed weight 1300g. . 1st Edition. Hardback. VG+/VG+ pc DW. NIAGARA: A History of the Falls. Kodansha International. 1992. Hardcover. 1568361548 . 1st prtg w/scant wear; cover/contents clean, bright, unmarked. DJ crisp w/very mild wear (no tears) . ; . Toronto: McClelland & Stewart Ltd, 1992. Hardcover. 8vo. Black and white maps. Light wear to spine ends; very good+ in very good, edgeworn dustjacket. McClelland & Stewart Ltd, 1994. Book. New. Paperback..
Excelsior Editions/State University of New Yo, 2009-07. Paperback. Good. CANADA: McClelland & Stewart, 1992. Book is in very good plus condition with very minor signs of wear and/or age. Dustwrapper/dustjacket is in very good condition with minor signs of wear and/or age.Minor edge spotting. SPECIAL POSTAGE RATES APPLY Packed weight 1300g. . 1st Edition. Hardback. VG+/VG DW.